Do you want to make key connections with professional Florists? Do you have products or services especially designed for the floral industry? Let me introduce you to a publication that can reach your target audience. I am the Executive Vice President of the Michigan Floral Association (MFA). Our mission is to provide our members with education and professional partnerships. 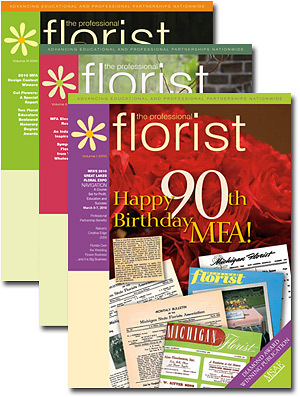 One of our primary resources for doing this is the Professional Florist magazine. The magazine is packed with insightful articles, valuable information, educational opportunities, and other relevant industry topics, which help keep the readers at the forefront of the floral industry. The magazine has an easy-to-read format, which encourages all who receive it to read it from front to back. Your advertisement will be seen in the Professional Florist. and effective way to get your message in front of the people who matter. Put the Professional Florist to work for you. A 2015 media kit with advertising rates, contract, and a digital copy of the magazine are attached. Please review and consider placing an advertisement today! Whether you would like one ad or a long-term contract we are here to help. I look forward to working with you and helping to increase your sales.